The travel industry has been shaken by a report in a national newspaper over the weekend claiming the government is considering issuing a warning to Brits not to book holidays after March 29 in case of a Brexit no-deal. 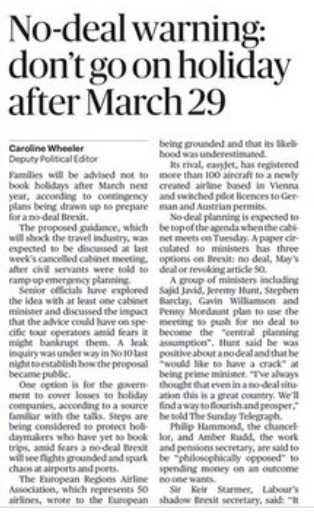 Ministers were quick to dismiss the front page story in the Sunday Times, which claimed the warning is part of contingency plans being drawn up by the government to prepare for a no-deal scenario. The report even claimed the government is considering bailing out travel companies whose businesses might be impacted as a result of the warning. Senior officials fear the advice could lead to bankruptcies in the industry, said the Sunday Times. Tour operators and agents were both shocked and bemused by the report. Sunvil managing director Chris Wright said it was 'just another story created by the press to instill fear into the minds of the public'. "We find it hard to believe that traditional holiday destinations for the British, from Spain to Greece, are likely to allow such a ridiculous scenario to play out. "With the speed of news at the moment, hopefully the article will fade into the background to be overtaken by something else." AITO has written to the Sunday Times editor asking why the article didn't seek any response from the travel industry, despite acknowledging the shock it would cause. It has also written to local MPs demanding an urgent response from the Prime Minister that there won't be any disruption to air travel in a no-deal Brexit. Throughout the Brexit negotiations, the government has consistently reassured the industry there will be no risk of disruption. John Tangney', deputy chair of AITO, added: "AITO is very disturbed to read The Sunday Times report, more especially following repeated assurances from HM Government that it is not true. It is a great shame that The Sunday Times seems to be trying to undermine or destabilise the travel industry. "Bear in mind that if people cannot go abroad, it will hit inbound traffic too - and business travellers - thus damaging our own holiday and hotel industries severely, and potentially hampering business deals to the detriment of the UK." Cruise association CLIA also expressed its dismay. "To say we were surprised and disappointed to read the story, which is simply not true, in the Sunday Times yesterday is an understatement," said a spokeswoman. "Comments such as this coming from the government are unhelpful and reckless, and we urge the government to instead focus on clarifying plans for Brexit as speedily as possible." ABTA issued a statement on Sunday in a bid to calm any fears among the British public. "Number 10 has said that the content of the report in the Sunday Times is categorically untrue," said a spokesman. "The European Commission has said that even in a no-deal scenario, flights will still operate between the UK and EU, and a visa is not required. "ABTA is providing holidaymakers and travellers with advice about Brexit and travel, including on pet passports and driving licences, which can be found at abta.com/brexit." Following the Sunday Times report, Brittany Ferries took the chance to reassure customers that ferry services won't be affected. "Shipping operates to international maritime law, rather than European agreements," said CEO Christophe Mathieu. "Accordingly, there is no question that we will continue to sail as normal on March 30 2019 and beyond, even if we are facing a no-deal Brexit. "Those who have already booked with us should be reassured and those looking to their 2019 voyage can book with confidence." The Sunday Times report came days after it was confirmed that Brits will be charged €7 to visit EU from 2021. EU countries will NEED to continue trading with the UK and Poles (amongst others) will not be happy at any serious restrictions on flying to/from the UK.